THE SHEPHERD AND THE LAMBS. N ONE OF His beautiful parables, Jesus compares Himself to a shepherd. "I am the good shepherd," says He, "the good shepherd giveth his life for the sheep." And Jesus tells how the hired servant who cares for nothing but his wages, runs away when the wolf comes; but how the faithful shepherd, when robbers threaten his flock, or wild beasts attack them, defends his sheep bravely, often laying down his life for their sake. Jesus also speaks of how the shepherd knows his sheep by name; and how, when he goes before them, they will follow him, because they know his voice, but that they will not follow strangers. And the Bible, speaking of Jesus Himself, says, "He shall carry the lambs in His bosom," or His arms, like the kind shepherd is doing in our picture. 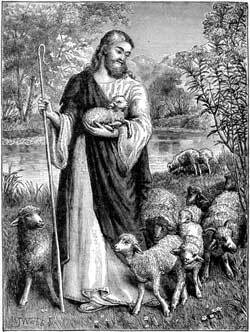 Now, why does Jesus call Himself the "good shepherd," and the Bible speak of Him as carrying the little lambs? Is it not because He loves us; because He knows each one of us; because He gave His life for us when He died on the cross, and has gone to heaven showing us the way thither; because He calls us to follow Him; and because He is so willing to lead even the tiny ones, and shield them from harm, just like the good shepherd carries the poor wee lamb? But Jesus asks one thing of us in return for all His kindness and care, and that one thing is our love. Are we giving Him our love now? Are we asking Him to lead us, and keep us safe from harm? May we seek to follow Him and to know His voice.